There was a time when a visit to the pub wasn’t complete without investing a few pounds in the fruit machine tucked away in the corner and this JPM slot will be familiar to anyone who remembers those days. It’s called Al Murray’s Golden game and it’s based on the ‘Landlord’, Murray’s famously right wing character. It’s full of features and comedy moments so keep reading for more details. 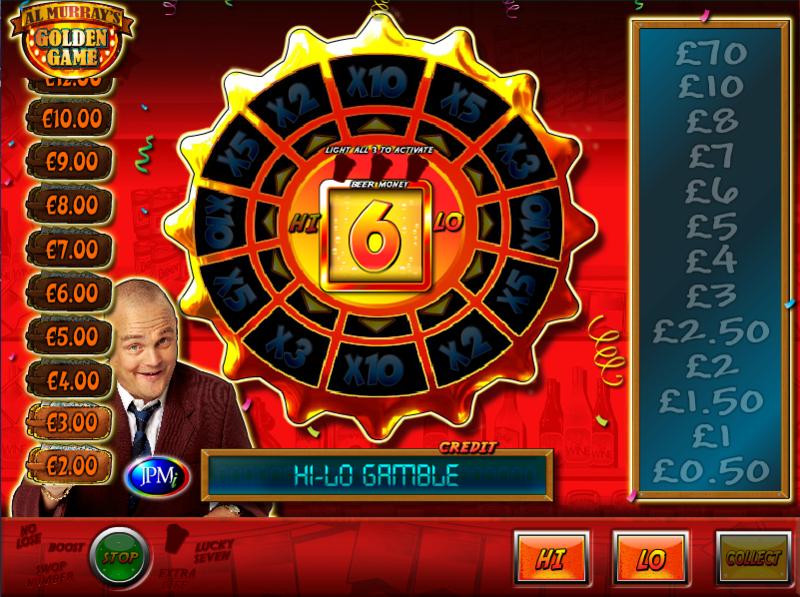 Al Murray’s Golden Game is a three reel slot with three rows and five paylines; the Landlord watches over proceedings from beside the reels, kissing a gold old pint of low quality lager. The paytable is above the reels while one of the feature trails is to the right. The symbols are of a traditional nature and include cherries, grapes, watermelons, Bars, Sevens and JPM logos. There’s also a chance that a symbol might contain a small gold barrel of which more below. This trails is scaled by landing those little golden barrels anywhere on the reels and you will climb one position for each payline the barrel appears on (a maximum of three on the centre of reel two). The goal is to reach the top of the trail after which you get to play a cash ladder Hi/Lo game for prizes. Double Trail – doubles the number of barrels. Respin – awards a respin to collect more barrels. Barrel Runner – player chooses to step up/down the reels to grab extra barrels or move existing ones to positions which cross more paylines. Choose A Trail – the trail will move randomly from one position to another so just try and stop it in the best position. Random Stop – moves the trail to a random position. Add Again – adds all barrels onto the trail again. 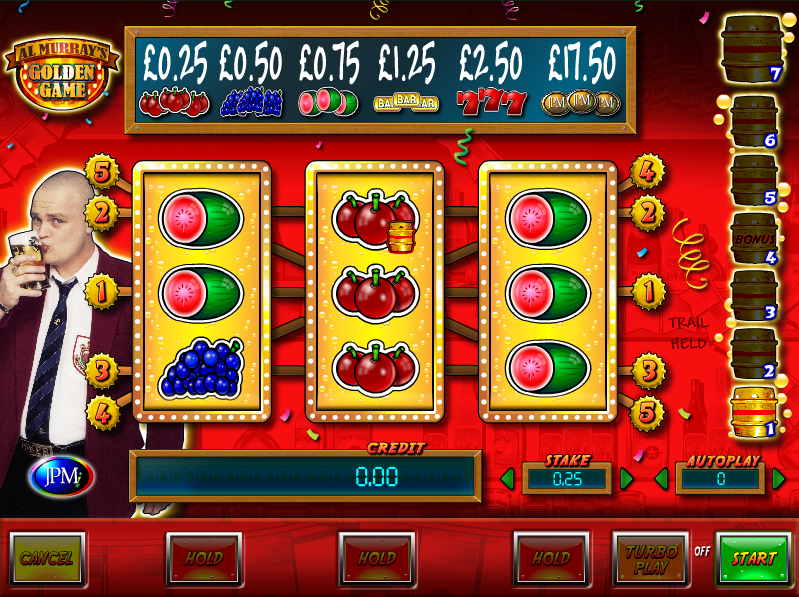 Each time you land a win on the reels you’ll have the opportunity to collect that prize or gamble in the Hi/Lo game. If you choose to gamble all you have to do is predict whether the next number spun will be higher or lower. If you’re correct you move up the cash ladder on the left, if you’re wrong the round ends. Lucky 7 – the next Hi/Lo gamble is a guaranteed winner. Boost – you move a random number of places up the cash ladder. Swap Number – exchange the Hi/Lo number. Extra Life – if you guess incorrectly you’ll get another go. No Lose – you will win the next Hi/Lo gamble. Pint – awards a pint which appears above the Hi/Lo numbers. Collect all three to start the Beer Money game in which you press the ‘Stop’ button to collect multipliers. Each collected position is blanked and when you land on one of those again the round is over. If all positions are blanked you get the chance to play a Yes/No game to repeat it. Al Murray’s Golden Game combines regular wins with plenty of bonus feature and for us it’s a real winner; the addition of the Landlord periodically yelling at you adds comedy to proceedings and this is definitely worth a go. It has an RTP of 94.00%.